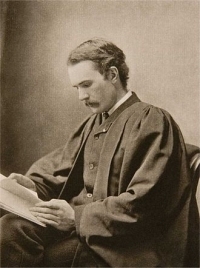 George Gilbert Aimé Murray, OM (2 January 1866 - 20 May 1957) was an Australian-born British classical scholar and public intellectual, with connections in many spheres. He was an outstanding scholar of the language and culture of Ancient Greece, perhaps the leading a. uthority in the first half of the twentieth century. After emigrating to Britain with his mother in 1877, he became in 1889-1899, Professor of Greek at the University of Glasgow. After 1908 he was Regius Professor of Greek at the University of Oxford. He was a lifelong supporter of the Liberal Party, lining up on the Irish Home Rule and non-imperialist sides of the splits in the party of the late nineteenth century. He supported temperance, and married into a prominent Liberal, aristocratic and temperance family, the Carlisles. For a brief period Murray became closely involved with the novelist H. G. Wells. Murray is often identified as a humanist, typically with some qualification ('classical', 'scholarly', 'engaged', 'liberal'). He wrote and broadcast extensively on religion (Greek, Stoic and Christian); and wrote several books dealing with his version of humanism.--Wikipedia. Epub 20130813.epub If you cannot open a .mobi file on your mobile device, please use .epub with an appropriate eReader. Mobi/Kindle 20130813.mobi Not all Kindles or Kindle apps open all .mobi files.